or by calling Deb Katz of the Citizens Awareness Network at (413) 339-5781. 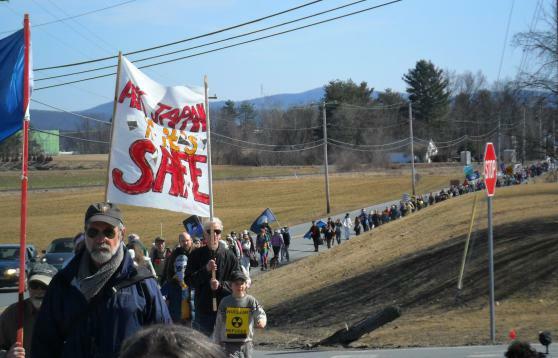 A major accident or act of sabotage at Vermont Yankee would kill thousands of people and leave an area the size of the Valley uninhabitable. Such a disaster is so likely that no insurance company will insure the facility; taxpayers would pay the costs of a meltdown. 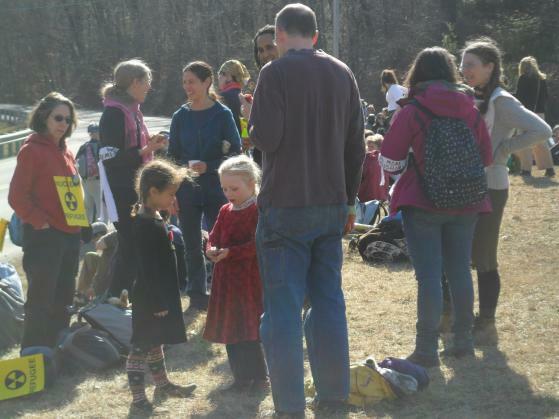 The hundreds of tons of nuclear waste at Vermont Yankee is the most toxic material on earth. The waste is so dangerous that it must be guarded 24 hours a day for the next 1 million years, according to the federal government. The electricity from Vermont Yankee is not needed, according to the state of Vermont, which in 2010 ordered Entergy to close the plant on March 21, 2012. Entergy sued Vermont in federal court and won the right to run the reactor until at least 2032. The state is appealing. We WILL shut it down! Submitted by Anonymous on Mon, 03/12/2012 - 13:38. Submitted by Anonymous on Mon, 03/12/2012 - 12:12. Thank you, marchers, for drawing attention to this anniversary.